Return to the Wild, One Year Later: Updating Us on Reintroducing the ‘Alalā to Their Forests! 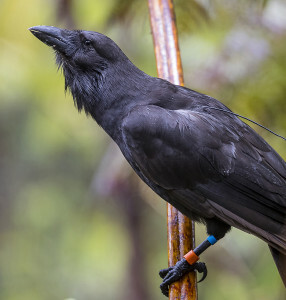 Through intensive conservation efforts, twenty-one ‘Alalā—the endemic and endangered Hawaiian Crow once considered extinct in the wild—have been reintroduced into native Hawaiian forests. These efforts are ongoing and plans are well under way for the next reintroduction. Rachel Kingsley, Education and Outreach Associate for The ‘Alalā Project, provides information about this unique species, an update on the birds that were recently reintroduced, and plans for future efforts to restore our beloved bird to its natural, wild home. Join us to learn more about this remarkable, highly intelligent crow species—integral to native Hawaiian ecosystems and culture—on two occasions: Monday evening, April 15, and the following afternoon, April 16.